For those who work in the medical device arena, talk of “being customer-centric” is all the rage – especially when it comes to placing a value on your product. But, in the medtech and pharmaceutical industries, the term “customer” refers to more than just the patient. It refers to all stakeholders – the diverse set of individuals, organizations, regulators, and policymakers who influence the perception of value, and eventually, the market access of your product. So, when we think about “customer-centrizing” efforts around value communications, we need to consider every stakeholder who defines value. A powerful process to achieve this is Contextual Intelligence or CI. What is contextual intelligence and why does it matter to your value communications? Contextual intelligence is a process that has been utilized in social science and business management circles for quite some time, but is only beginning to enter the medical device marketing vernacular and practice. Simply put, CI helps you identify and understand your stakeholders’ pre-existing beliefs, emotions, and behaviors – and the context that frames them – so that your messages are more relevant and resonant. For medical device innovators, what makes the process more complicated is figuring out how to address the often-competing demands of stakeholders when it comes to the value proposition. Specifically, WHO are the most important and influential stakeholders in determining the value of your product? And HOW can you bring all these stakeholders to the table for consensus-driven decision-making? This is where the true power of contextual intelligence lies. You’re probably already considering – perhaps with varying degrees of success – the needs of Payers, Providers, and Patients – your “3Ps”. 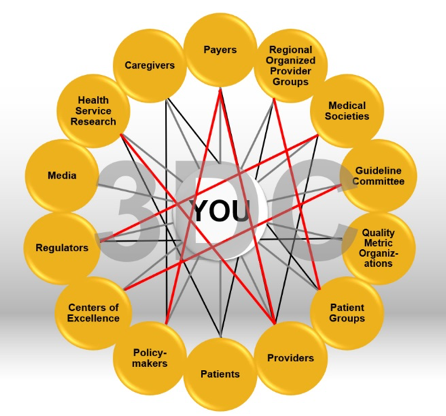 But in today’s increasingly complex healthcare environment, it’s essential to assess and address a wider group of influential stakeholders and to understand their roles at the regional, national, and even global levels. These individuals and groups can be powerful influencers in communicating the value of your product. At 3D, we’ve identified a distinct (and growing number) of stakeholder groups whose influential voices and needs can affect your product’s future. They include Centers of Excellence, Caregivers, and Media, just to name a few. In fact, some governmental entities have started to redefine the touchstones of “best practice.” Their approach expands the concept of “evidence” into four key areas: research-, clinical-, patient-, and public-based experience. This innovative and novel model enables multiple stakeholders to weigh in on the cost-effectiveness of new medical devices or on the societal value of a device or procedure. Once you decide WHO to prioritize as the most important stakeholders, it’s important to understand HOW to effectively leverage their respective expertise for your value communications. One challenge is that when you bring large groups of stakeholders to the table, conflicting opinions can throw a wrench into reaching consensus. Fortunately, applying contextual intelligence can help you rein in conflicting views, settle differences, and promote stakeholder collaboration. Convene a value communications roundtable. Once identified, it’s essential to convene representatives from these stakeholder groups around THE SAME TABLE…at the SAME TIME. You may be used to running separate “ad boards” to understand different stakeholder viewpoints. At 3D, we urge clients to convene representatives from diverse stakeholder groups so we can understand their individual points of view – and perhaps more importantly – how they influence each other. These roundtables can also reveal what stakeholders need to hear to resolve differences. Understand the context of conflict to mediate/overcome differing stakeholder points of view. Contextual intelligence is a powerful tool to overcome discord and disagreements, and turn conflict into an asset that both stimulates and activates creativity and innovation. The straightest path to achieving consensus-based value communications is to help key stakeholder representatives reimagine their opinions and by default, their roles. Consider how a jazz ensemble operates and thrives: the players play off one another, appreciate one another’s different playing styles, and listen and hear the distinct points of view communicated through the piece. They ‘reimagine’ the original notes, responding to them intuitively and through improvisation, leveraging their knowledge and comprehension, and embracing shifting but fluid roles. While stakeholder conflict mimics cacophony, conflict resolution is harmonious. By encouraging each participant to first listen to what another stakeholder is saying, and then practice accurately repeating and recapping it, using the original words, greater harmony can be realized. Use context to identify the origin of stakeholder values and organizational goals. A Gordian knot may be a good visualization of how to unravel the framework for problems that are seemingly too complicated to solve – like stakeholder conflict! Contextual intelligence can be harnessed to resolve or reorganize Gordian knots around market access. Since self-interest and the psychological “need to win” often come from organizational pressures, there are tactical ways to identify them. Having each stakeholder ask open-ended questions about organizational challenges, pressures, pain points, and imperatives, and exchanging ideas about how untying those knots might benefit or harm overall mandates can help to foster better understanding within and among key stakeholders. The increasingly complex value and market access environment calls for a more comprehensive approach in preparing for and maximizing the value of your product. While consensus can be challenging in the midst of conflicting stakeholder values and roles, a little context can go a long way in achieving market access success.